How is the weather where you guys are? Over here, it’s been a week of grey days. I’ve been doing some traveling and spent a few days in Moscow, more provincial Russia, London (and by that, really, I just mean Heathrow, haha) and Istanbul. Overcast grey days with some cripple and moist coming down from the low clouds. Days when you need to turn on the lights at 2:30pm already. To lift up the mood and fill the body with good protein, I decided it was time to make a good colorful soup! 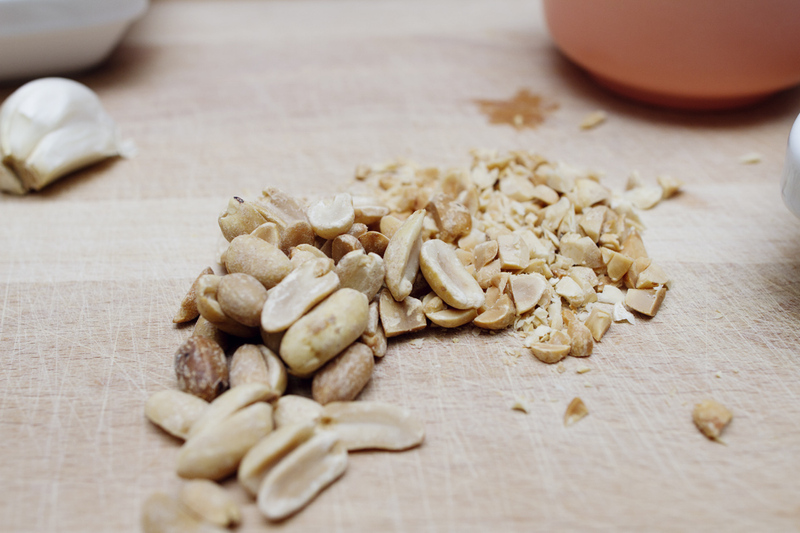 A couple of days ago, I had earmarked the recipe to a peanut soup from Cookie + Kate and we had almost all recipes at home for a slight variation! The original recipe is vegetarian but as we just started saying no to breads, potatoes and gluten, I wanted to make it a bit richer (even) and make sure we got a portion of chicken in. So below is my amended recipe. 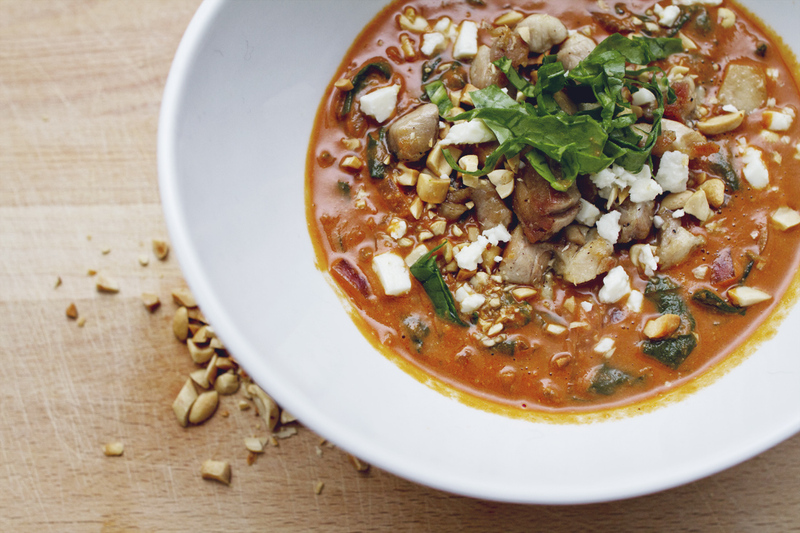 Chicken Peanut Soup – aka the remedy to grey days! 1. In a pot, heat up the chicken stock and bring to a boil. Add onion, ginger, garlic and season with salt and pepper. Reduce the heat and simmer for 15 minutes. 2. Cut the chicken breast into cubes, and cook in the pan with the coconut oil and salt and pepper. 3. In a medium-sized mixing bowl, combine the peanut butter and tomato paste. Add a cup of hot chicken stock from the simmering pot and whisk together well until smooth. Pour the peanut butter, tomato paste, chicken stock mixture into the soup on the stove. 4. Add the collar green into the peanut butter soup and simmer for another 10-15 minutes. 5. 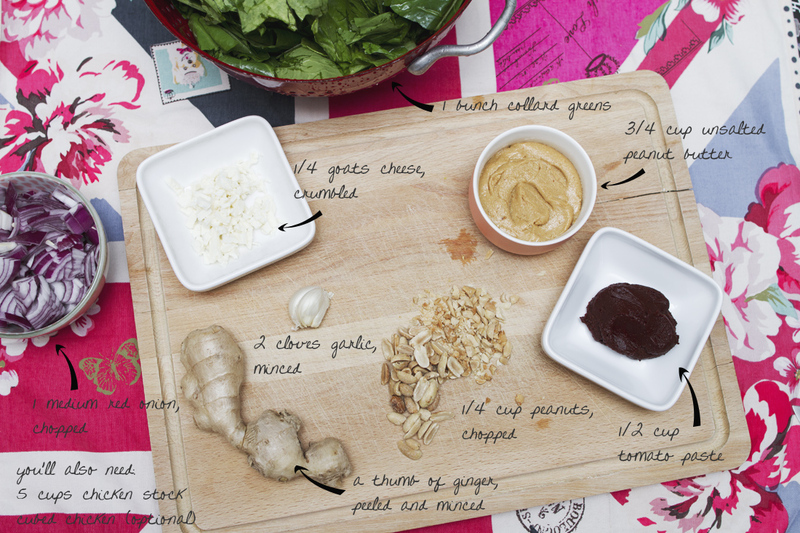 Serve the soup in large bowls and in the bow, add cooked chicken cubes and goats cheese, sprinkle with chopped peanuts. Posted in Lift my moodTagged chicken, food to lift my mood, healthy food, healthy recipe, healthy winter food, I love cooking, organic food recipe, peanut, peanut butter, protein food, protein rich food, recipe ideas for winter, recipes rich in protein, soup recipe, soups, warming food, warming food recipe, winter recipeBookmark the permalink.